The Dual VERSA-PRO bench seat is engineered as a 40/20/40 bench seat, inspired by modern pick-up trucks. The Defender MAX DPS can comfortably accommodate six adults and features “profiled” corners to improve entrance / exit of the cab as well as a sturdy vinyl cover for improved wear resistance. The five passenger seats have integrated hooks on their underside and can also be flipped up to improve onboard storage. 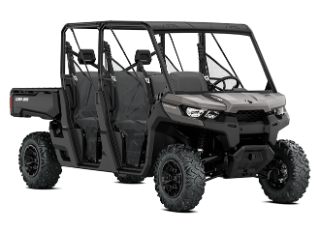 Can-Am designers also added front and rear foldable armrests with cup holders. The highly durable Cargo box has a 1,000-lb (454kg) load capacity and easily dumps. 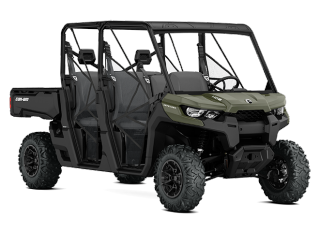 Strategic features include 5-gal (18.9 L) pail recesses, integrated anchors on the sidewalls and several tie-down points for added convenience. To fully optimize the sizeable cargo box, consumers can divide up the box using the integrated recesses. The box allows for both 1x3 and plywood separators and accepts bed extenders for refining the bed’s overall dimensions. Also, the sturdy tailgate can withstand ordinary farm use and serve as a seat during your lunch break (max weight: 250 lb / 113kg).